نیکومنظری, الهام, فتاح الحسینی, آرش, گشتی, سید امید. (1396). اعمال پوشش سرامیکی به روش اکسیداسیون الکترولیتی پلاسمایی روی زیرلایه Ti-6Al-4V و بررسی رفتار خوردگی آن در محلول شبیه‌ساز بدن. 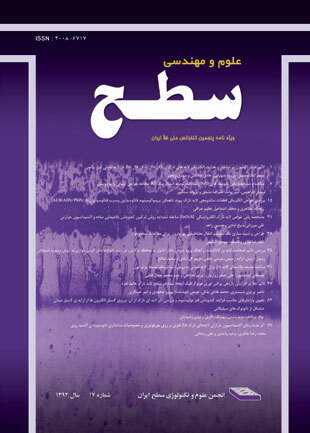 نشریه علوم و مهندسی سطح, 13(33), 1-11. الهام نیکومنظری; آرش فتاح الحسینی; سید امید گشتی. "اعمال پوشش سرامیکی به روش اکسیداسیون الکترولیتی پلاسمایی روی زیرلایه Ti-6Al-4V و بررسی رفتار خوردگی آن در محلول شبیه‌ساز بدن". نشریه علوم و مهندسی سطح, 13, 33, 1396, 1-11. نیکومنظری, الهام, فتاح الحسینی, آرش, گشتی, سید امید. (1396). 'اعمال پوشش سرامیکی به روش اکسیداسیون الکترولیتی پلاسمایی روی زیرلایه Ti-6Al-4V و بررسی رفتار خوردگی آن در محلول شبیه‌ساز بدن', نشریه علوم و مهندسی سطح, 13(33), pp. 1-11. نیکومنظری, الهام, فتاح الحسینی, آرش, گشتی, سید امید. اعمال پوشش سرامیکی به روش اکسیداسیون الکترولیتی پلاسمایی روی زیرلایه Ti-6Al-4V و بررسی رفتار خوردگی آن در محلول شبیه‌ساز بدن. نشریه علوم و مهندسی سطح, 1396; 13(33): 1-11. در این پژوهش، تأثیر غلظت الکترولیت فسفات سدیم بر ریزساختار، الگوی پراش پرتوایکس و رفتار خوردگی آلیاژ Ti-6Al-4V پوشش داده‌شده به روش اکسیداسیون الکترولیتی پلاسمایی مورد بررسی قرارگرفته است. به‌ منظور این بررسی، الکترولیت‌های قلیایی-فسفاتی با غلظت‌های متفاوت 8، 12 و 16 گرم بر لیتر مورد استفاده قرار گرفت. ریزساختار و ترکیب شیمیایی نمونه‌های پوشش داده شده توسط میکروسکوپ الکترونی روبشی و الگوی پراش پرتو ایکس مورد آنالیز قرارگرفته است. خواص خوردگی پوشش‌ها در محیط شبیه‌ساز بدن­ (هنک) توسط آزمایش‌های پلاریزاسیون پتانسیودینامیک و طیف‌سنجی امپدانس الکتروشیمیایی موردمطالعه قرارگرفته است. در فرآیند پوشش­دهی، افزایش غلظت فسفات سدیم منجر به افزایش هدایت الکتریکی حمام‌ها، متوسط اندازه تخلخل‌ها و ضخامت پوشش‌ها شد. نتایج حاصل از الگوی پراش پرتو ایکس نشان داد که با افزایش غلظت فسفات سدیم، فاز شبه‌پایدار آناتاز به فاز پایدار روتیل تبدیل شد. درنتیجه با افزایش غلظت الکترولیت میزان فاز روتیل موجود در پوشش افزایش و میزان فاز آناتاز کاهش‌یافته است. بیش­ترین پتانسیل خوردگی (391 میلی ولت) به همراه کمترین چگالی جریان خوردگی (8-10× 18/6 آمپر بر سانتی­متر مربع) در پوشش ایجادشده در الکترولیت حاوی 12 گرم بر لیتر فسفات سدیم منجر به بیش­ترین مقاومت به خوردگی (8/8 مگا اهم) شد. مقاومت به خوردگی سایر نمونه­ها 2 الی 6 مرتبه کمتر از نمونه حاوی 12 گرم بر لیتر فسفات سدیم است. 1. X. Shi, L .L. Xu and Q .L. Wang, Porous TiO2 film prepared by micro-arc oxidation and its electrochemical behaviors in Hank's solution ,Surface and Coatings Technology, 205(2010)1730-1735. 2. S. Durdu, O. F. Deniz, I. Kutbay and M. Usta, Characterization and formation of hydroxyapatite on Ti6Al4V coated by plasma electrolytic oxidation, Alloys and Compounds, 551(2013)422-429. 3. H. Cimenoglu, M. Gunyuz, G. T. Kose, M. Baydogan, F. Uğurlu and C. Sener ,Micro-arc oxidation of Ti6Al4V and Ti6Al7Nb alloys for biomedical applications, Materials Characterization, 62(2011)304-311. 4. M. Geetha, A. K. Singh, R. Asokamani and A. K. Gogia, Ti based biomaterials, the ultimate choice for orthopaedic implants – A review, Progress in Materials Science, 54(2009)397-425. 5. Y. L. Cheng, X. Q. Wu, Z. Xue, E. Matykina, P. Skeldon and G. E. Thompson, Microstructure, corrosion and wear performance of plasma electrolytic oxidation coatings formed on Ti6Al4V alloy in silicate-hexametaphosphate electrolyte, Surface and Coatings Technology, 217(2013)129-139. 6. X. Liu, P. K. Chu and C. Ding, Surface modification of titanium, titanium alloys, and related materials for biomedical applications, Materials Science and Engineering R, 47(2004)49-121. 7. Y. Harada and S. Kumai, Effect of ceramics coating using sol–gel processing on corrosion resistance and age hardening of AZ80 magnesium alloy substrate, Surface and Coatings Technology, 228(2013)59-67. 8. G. S. Kaliaraj, M. Bavanilathamuthiah, K. Kirubaharan, D. Ramachandran, K. Viswanathan and V. Vishwakarma, Bio-inspired YSZ coated titanium by EB-PVD for biomedical applications, Surface and Coatings Technology, 307(2016)227-235. 9. H. Tang, Q. Sun, T. Xin, C. Yi, Z. Jiang and F. Wang, Influence of Co(CH3COO)2 concentration on thermal emissivity of coatings formed on titanium alloy by micro-arc oxidation, Current Applied Physics, 12(2012)284-290. 10. J. M. Wheeler, C. A. Collier, J. M. Paillard and J. A. Curran, Evaluation of micromechanical behaviour of plasma electrolytic oxidation (PEO) coatings on Ti6Al4V, Surface and Coatings Technology, 204(2010)3399-3409. 11. L. Xiu, Z. Minhao, Z. Jianfeng, L. Jun and M. Jilian, Fretting wear of micro-arc oxidation coating prepared on Ti6Al4V alloy, Transaction of nonferrous metals society of China, 20(2010)357-546. 12. F. C. Chang, C. J. Wang, J. W. Lee and B. S. Lou, Microstructure and mechanical properties evaluation of molybdenum disulfide-titania nanocomposite coatings grown by plasma electrolytic oxidation, Surface and Coatings Technology, 303(2016)68-77. 13. F. Jin, P. K. Chu, K. Wang, J. Zhao, A. Huang and H. Tong ,Thermal stability of titania films prepared on titanium by micro-arc oxidation, Materials Science and Engineering A, 476(2008)78-82. 14. T. S. N. Sankara Narayanan, S. Park and M. H. Lee, Strategies to improve the corrosion resistance of microarc oxidation (MAO) coated magnesium alloys for degradable implants: Prospects and Challenges, Progress in Materials Science, 60(2014)1-25. 15. R. F. Zhang, L. P. Qiao, B. Qua, S. F. Zhang, W. H. Chang and J.H. Xiang, Biocompatibility of micro-arc oxidation coatings developed on Ti6Al4V alloy in a solution containing organic phosphate ,Materials Letters, 153(2015)77-80. 16. K. Venkateswalu, N. Rameshbabu, D. Sreekanth, A. C. Bose, V. Muthupandi, N. K. Babu and S. Subramanian, Role of electrolyte chemistry on electronic and in vitro electrochemical properties of micro-arc oxidized titania films on Cp Ti, Electrochemica Acta, 105(2013)468-480. 17. K. Venkateswalu, N. Rameshbabu, D. Sreekanth, A. C. Bose, V. Muthupandi, N. K. Babu and S. Subramanian, Role of electrolyte additives on in-vitro electrochemical behavior of micro arc oxidized titania films on Cp Ti, Applied Surface Science, 258(2012)6853-6863. 18. S. Stojadinovi, N. Radi, R. Vasili, M. Petkovi, P. Stefanov, L. Zekovi and B. Grbi, Photocatalytic properties of TiO2/WO3 coatings formed by plasma electrolytic oxidation of titanium in 12-tungstosilicic acid, Applied Catalysis B: Environmental, 126(2012)334-341. 19. S. Ikonopisov, Theory of electrical breakdown during formation of barrier anodic films, Electrochemical Acta, 22(1977)1077. 20. A. L. Yerokhin, X. Nie, A. Leyland, A. Matthews and S. J. Dowey, Plasma electrolysis for surface engineering, Surface and Coatings Technology, 122(1999)73-79. 21. A. Fattah-alhossein and M. Sabaghi Joni, Effect of KOH concentration on the microstructure electrochemical properties of MAO-Coated Mg Alloy AZ31B, Materials Engineering and Performance, 24(2015)3444-3452. 22. M. Aliofkhazraei, R. Shoja Gharabagh, M. Teimouri, M. Ahmadzadeh, G. Barati Darband and H. Hasannejad, Ceria embedded nanocomposite coating fabricated by plasma electrolytic oxidation on titanium, Alloys and Compounds ,685(2016)376-383. 23. Z. Yao, Y. Jiang, F. Jia, Z. Jiang and F. Wang, Growth characteristics of plasma electrolytic oxidation ceramic coatings on Ti6Al4V alloy ,Applied Surface Science, 254(2008)4084-4091. 24. X. Yang, S .Yu and W. Li, Preparation of bioceramic films containing hydroxyapatites on Ti6Al4V alloy surfaces by the micro-arc oxidation technique , Materials Research Bulletin, 44 (2009)947-949. 25. K. R. Shin, Y. G. Ko and D. H. Shin, Effect of electrolyte on surface properties of pure titanium coated by plasma electrolytic oxidation, Alloys and Compounds, 506(2011)478-481. 26. M. Shokouhfar, C. Dehghanian, M. Montazeri and A. Baradaran, Preparation of ceramic coating on Ti substrate by plasma electrolytic oxidation in different electrolytes and evaluation of its corrosion resistance: Part II, Applied Surface Science, 258(2012)2416-2423.